As we all know that YouTube is the biggest video sharing website that offer streaming videos for downloading and watching. Opening YouTube to watch fun videos would be an daily task for everyone. But when if you are on a trip or travel without computer at hand? It goes without saying that iPhone and iPad would be the perfect media storage for people to store YouTube videos. But now as the ultimate tablet, iPad take place of iPhone gradually, not to mention the iPad 2. However the case is not as you imagined, since the videos downloaded from YouTube are FLV formats, and some are MP4 formats with higher resolution. All of these YouTube formats couldn't be played back on iPad or iPad 2. All you need to do is converting YouTube video to iPad/iPad 2 supported video & audio format. 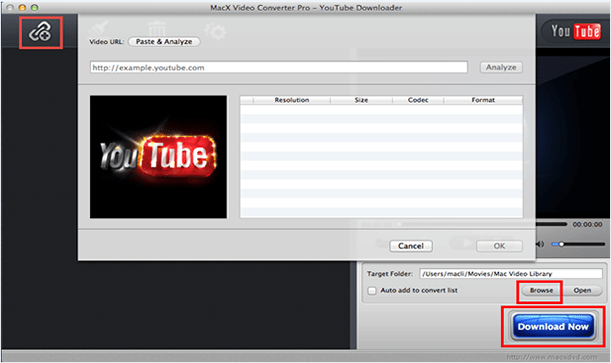 MacX Video Converter Pro help you download YouTube FLV and MP4 videos, as well as Facebook, Vimeo, Vevo, Dailymotion, Metacafe, Myspace, XNXX videos (300+ video sharing sites supported) and convert the bunch of online videos to iPad/iPad 2/iPad mini 4/Air 2/Pro with a few clicks. No.1 YouTube downloadr for iPad 2 to free download YouTube video to iPad 2/mini 4/Pro etc in 4K UHD/HD 1080p/720p with fast speed and original quality! How to Watch YouTube HD movies videos on iPad, iPad 2 with this YouTube to iPad video downloader & converter? There are three basic steps you have to do, download YouTube video, convert them to iPad video format, and transfer the output video to iPad/iPad 2. You could find the detailed guide as below. Frist of all, free download this YouTube Downloader software for iPad 2 if you want to watch YouTube video on iPad. However, this video converter is an all-in-one solution which build the YouTube download inside. You just need to click YouTube button to add the YouTube video URL for download and convert. If you already opened a YouTube URL before you run the program, it will automatically paste it for you. 2. Convert YouTube Video to iPad/iPad 2/iPad Air 2/iPad mini 4 Supported Video Format. Now It is time to convert the YouTube video to a format compatible with your iPad/iPad 2. MacX Video Converter Pro lets you convert YouTube clips to iPad/iPad 2 straightly by selecting "To iPad" as the output format. Then, If needed you can also do some basic video editing using the converter, including trimming video segment, stretch the video to full screen, change the video file size by adjusting the parameter settings, etc. At last, browse the destination folder to store the output iPad video files and click RUN button to trancoding YouTube formats to iPad/iPad 2. Note: This tutorial is for Mac user. For Windows user, Here is MacX HD Video Converter Pro for Windows to transcode YouTube Video to iPad/iPad 2 on PC. After downloading YouTube videos to iPad Pro/mini 4/Air 2, you will need to transfer YouTube videos from Mac to iPad. 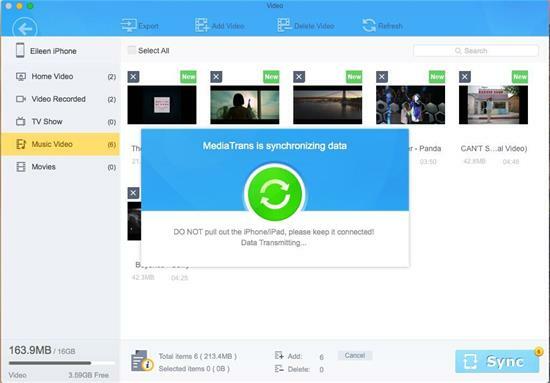 MacX MediaTrans, a fantastic iPad transfer tool, allows you to import videos from Mac to iPad seamlessly at very fast speed, not only the Camera Roll videos, but also YouTube downloaded videos, DVD movies etc. Moreover, this iPad transfer is featured with converting videos to iPhone iPad iPod automatically during the transferring process. Before you start, free download this Mac to iPad transfer and launch it on Mac computer, or download Windows version and fire it up. The iPad video transfer for Mac introduced here supports to save video to iPad Pro/Air 2/Mini 4 all iPad generations. Step 1: Connect your iPad to Mac with a USB cable. This iPad transfer will automatically detect and scan your iPad data, videos, music and photos on Mac computer. Step 2: Click "Video" icon to check your iPad videos on Mac which are displayed by categories. Home Video, TV Show and Music Video all accepted new videos or movies importing. Step 3: Click "Add Video" button to import the target YouTube videos from Mac to iPad. Then press "Sync" button on the lower right corner to finally save videos to iPad. Do you want to convert video for playback on iPad tablet? This article shares 3 best video converter for iPad and tells you how to convert MKV M2TS FLV AVI MP4 to iPad Air/iPad Mini 2/iPad 4/3/2 viewable format easily with the best iPad video converter. Top 10 best free movie apps for iPad Pro to watch free movies on iPad Pro(iPad Mini 4/Air 2, iPhone 6s/Plus included), stream and download free Hollywood Bollywood Tamil Disney movies in 720p HD 4K on iPad Pro.